A 15 minute drive from Manhattan’s towering financial district takes you into the heart of Brooklyn, to the neighborhood of Bedford-Stuyvesant, better known as Bed-Stuy. Located in Kings County, New York, Bed-Stuy was once called the largest ghetto in the nation. Bed-Stuy is gentrifying quickly, but as rental prices rise, poverty remains rampant in many neighborhoods. 25.6% of children and 20.14% of all residents are living in food insecure households. 23.4% of all individuals are living below the poverty line. 35% of individuals are living below the poverty line. 36.1% of adults have never completed high school (estimated). 19.1 of all households are single women with children (estimated). Bed-Stuy’s population is 77% African-American and 18% Hispanic, and the area is home to many recent immigrants to the United States. Family-to-Family’s community partner here is the Bed Stuy Campaign Against Hunger (BSCAH), a SuperPantry and social service agency that provides food and other vital assistance to more than 9,000 needy New Yorkers each month. High unemployment in a stagnant economy continues to bring hundreds of new families to the BSCAH food pantry each month, including growing numbers of working families who can no longer make ends meet, says BSCAH Executive Director and founder Dr. Melony Samuels. But as the need for food and other services continues to spike, food supplies don’t keep pace, leaving BSCAH at times with no option but to turn people away. Those who do receive food are leaving with less of it. 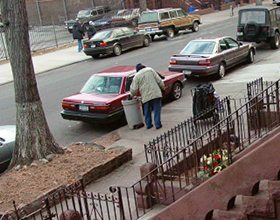 Learn more about the hardships facing the Bedford-Stuyvesant community.